This costume representing the concept of Valkyrie was worn by a gloriously exaggerated Germanic showgirl in the musical The Producers which opened at the Theatre Royal Drury Lane in November 2004 and ran for over two years. 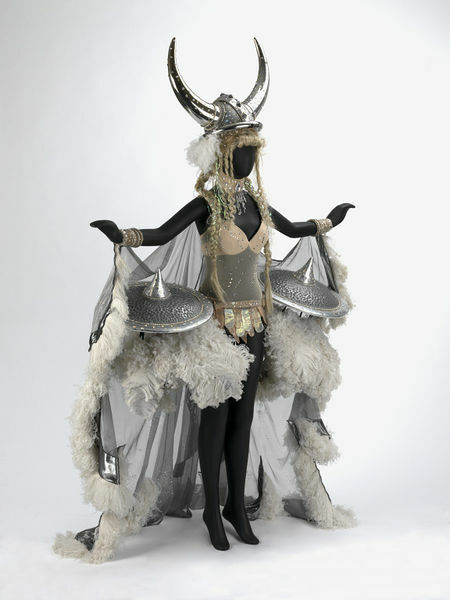 This was one of four similarly outrageous showgirl costumes on Germanic themes designed by William Ivey Long, the others representing the German sausage, German beer and the pretzel. Based on the classic 1968 Mel Brooks film, The Producers was originally produced on Broadway where it won twelve Tony awards. The story concerns the failing Broadway producer Max Bialystock who aims to make millions by raising over-investment in Springtime For Hitler, a tasteless musical by an ex-Nazi storm-trooper which Max considers to be a guaranteed flop. In its scandalous closing number, the outrageously 'camp' Fuhrer took centre stage with four showgirls who paraded in the four unwieldy but hilarious costumes, including this 'essence of Valkyrie'. 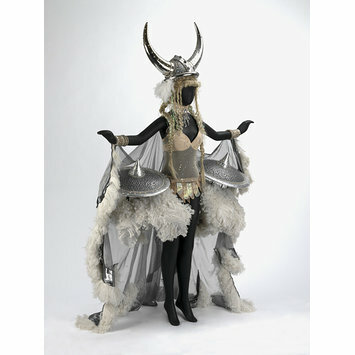 Costume designed by William Ivey Long for a showgirl dressed as a Valkyrie in the London production of Mel Brooks's musical The Producers, Theatre Royal Drury Lane, 2004. The showgirl is one of four girls who appear in the closing number, Springtime for Hitler, dressed to symbolise Germany. The others are a sausage, a beer stein and a pretzel.